We've seen the core X-Men team receive new styles as of late (1, 2). Now their erstwhile farm team, the New Mutants, are boasting similarly sleek makeovers, courtesy of concept artist Daniel Govar and superhero costume design site Project Rooftop. 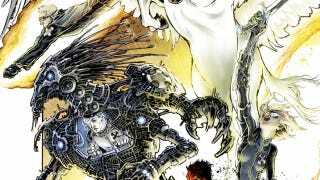 Check out his takes on Warlock, Sunspot, and your other favorite mutant hardbodies. [For Cannonball] I remember turning tight in the comic was always an issue for him, and thought retractable tail-fins would work. The military bar strips at the top of his flight jacket I thought were just to touch to say "leader." [Magik's] badge/communicator X and the duo-tone leathery motifs being the pieces that married her to group. I tried to give what was there of the cut and blade style to be Russian with a twist. [Sunspot] – coming from money, I figured would have the nicest threads. I also saw him as slightly detached from the others – not having any particular buddy or pal. I originally gave him an all white loose-fitting uniform, with an X badge belt-buckle, but the more I thought about him the more I pictured posturing wrestlers.